On Tuesday I wrote about the difficult decision of child relocation, with reference to the recent case of Re C (N, W & H). On Wednesday I wrote a post describing some of the cases that the Court of Protection has dealt with this month. Yesterday I wrote a post asking whether there is any point in defended divorce, and suggested that perhaps it is time to do away with the right to defend. Perhaps next week my muse will return. Until then, have a good weekend. It's been a pretty quiet week thus far. No doubt many took the rest of the week off after the bank holiday to enjoy the school Spring break with their children, although with the rain we've had they're probably regretting it. OK, there have been a couple of new judgments, but they have been of the 'published because of transparency guidance' sort, rather than because they are of any real interest, save to those involved. We did have the story in The Independent of the letter that Grant Thornton's lawyers wrote to Mr Justice Moor, criticising him for his findings in the Young case. I would have loved to have been a fly on the wall of Mr Justice Moor's chambers when he read that. I would also be very interested to read his 'robust response'. Incidentally, the story informs us that Michelle Young is still awaiting her £20 million lump sum. Now there's a surprise. Otherwise, I enjoyed this article by Rachel Rothwell in the Gazette, in which she argues that the government should fix the courts system, rather than continually push ADR. I couldn't agree more. ADR is not a panacea, a cheap alternative to court. As she says, compromise isn't always appropriate: "sometimes one party really is entirely in the right, and they need their day in court to have their position vindicated, and their costs paid by their opponent". In any event, the issue has never been about those people who settle their disputes outside of court (they have of course always done this, long before the initialism 'ADR' was first coined) - the issue is those cases that can't be settled, where the court is required to step in. If we don't have a court system to do this, how will such disputes be resolved? As one of the commenters to the article says, it's time for the government to stop flogging the dead horse of mediation as a direct alternative to court. And that is about it. If you're on holiday, enjoy the rest of your break (hopefully the sun will make a late appearance). If you're not on holiday, enjoy the coming weekend anyway. On Monday I wrote a post debunking some of the myths surrounding marriage, with particular reference to the views views of Sir Paul Coleridge, late of the judiciary. On Tuesday I wrote about the Re L case, and the effect of domestic violence on children. 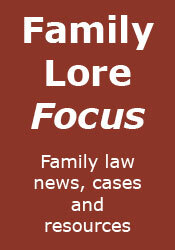 Lastly, I wrote a double-header on the reform of family law over the last forty years. Part 1 can be found here and part 2 here. Hopefully, I will have a little more time to post chez Family Lore next week. Until then, have an excellent weekend and Spring bank holiday. A quick heads-up for a Supreme Court decision today on inchoate rights of custody, in In the matter of K (A Child) (Northern Ireland). The case concerned an appeal by the Lithuanian grandparents of a child against the refusal of an application for a declaration that their grandchild was being wrongfully retained by his mother in Northern Ireland, in breach of their rights of custody. 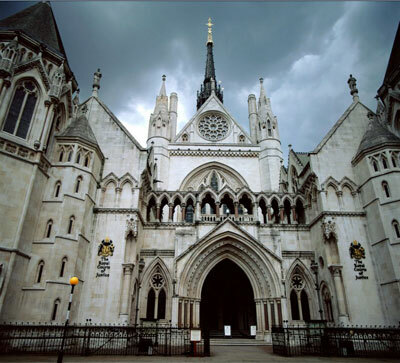 The Supreme Court allowed the appeal by a majority, who considered that the English courts should continue to recognise inchoate rights as rights of custody under the Hague Convention and the Brussels II Revised Regulation, provided that certain conditions applied. The full report of the judgment can be found here (HTML version here) and a press summary here. The case K (Children)  EWCA Civ 1776 has just popped up on Bailii, although it was decided last October. For the most part it is a fairly standard long-running private law children dispute, albeit with some rather nasty facts. This particular judgment, the latest in an apparently long line, concerned the father's appeal against an order by Judge Bellamy reducing his supervised contact with the children to two occasions a year and imposing a section 91(14) order for a period of ten years. "Very sadly, the litigation history of this case is extensive. Black J, as she then was, held a fact finding hearing in relation to serious allegations and made findings of fact in September 2007. In 2008, she had to undertake a second fact finding hearing, which led to the reversal of some of these original findings in a judgment delivered on 13 August 2009. In particular, a wound the father sustained in May 2007 was found to be self inflicted, and a fire which occurred in the father's house in September 2009 was found to be the responsibility of the father himself." As a result, Black J granted a residence order to the mother, supervised contact every month to the father and made a section 91(14) order for a period of two years. "The key issue upon which the unconditional permission which was granted was based was whether Judge Bellamy had failed to take into account what was referred to by father's counsel as his privilege against self incrimination; that is, the privilege that can be found in section 14 of the Civil Evidence Act 1968. The single judge was taken to the transcript of the cross-examination of father in the court below, and he had demonstrated to him the importance that Judge Bellamy had placed upon the father's response to the findings of Black J. To put the matter simply, father had not accepted the truth of the most serious of the findings made by Black J, including the issues of self inflicted stabbing and fire raising in his discussions with the forensic psychiatrist instructed in the proceedings, nor in the cross-examination, which included examination by the judge himself." "As a consequence, as can be ascertained from the judgment, Judge Bellamy concluded that father remained very dangerous and that the risk of the abuse of the mother and the risk of abduction of the children remained high or very high. The import of the appeal was to demonstrate that father told the judge that he could not or would not answer questions about those findings because he relied upon what he described as his privilege against self incrimination and hence the negative inferences drawn against him should not have been so." "The submission was that the judge should have taken into account the father's refusal to answer questions, no doubt on advice, and not made adverse findings against him." "That has the consequence that the primary ground of this appeal falls away. It can no longer be asserted that Judge Bellamy made an error in his evaluation of father's evidence with the inevitable consequence that the index of dangerousness and the nature and extent of the risk of harm remain in place." Firstly, Cafcass has published its latest figures for care applications and private law demand, for April. The 'headlines' are quite interesting. As to care applications, these decreased by 13% compared to April 2013. They also decreased by 5% in the period April 2013 to March 2014 compared to the previous year, which was the first fall in the annual rate since the Baby P scandal. Has the tide finally turned? As to private law demand, this fell by 24% compared to April 2013, with the abolition of legal aid no doubt having an effect. Cafcass also released statistics showing the number of care applications received per 10,000 child population - the rate of care applications - by each local authority in England with children’s services responsibilities. The numbers run from 2008-09, the year of the Baby P case, to 2013-14. They show that over this period the rate of application rose from 5.9 in 2008-09 to 9.7 in 2012-13, a rise of 64%, but that it has dropped to 9.2 in 2013-14. This is lower than 2012-13 levels but is still higher than 2011-12 levels. The full statistics can be found, in spreadsheet form, here. Moving on, the Judiciary of England and Wales has published Mr Justice Holman's judgment of the 1st of May in the Chai v Peng case. This is the one in which he got rather annoyed at Mr Peng's absence, as reported by The Independent the other day. Lastly, whilst finding that judgment I could not help noticing that the Judiciary's website has been updated. It is certainly clearer and, mercifully, a lot quicker to load. It also now goes under a new name: 'Courts and Tribunals Judiciary'. I don't know why this is (apart from the general rule that nothing is allowed to stay the same for more than five minutes), but I suppose there must be a good reason. Friday Review: Has the silly season begun? Meanwhile, in more good news for divorce lawyers Katie Price announced on Twitter (where else?) that she was untying the knot for the third time. She informed her 1.9 million followers (yes, there really are 1.9 million people sad enough to follow her) that she was divorcing her third husband Kieran Hayler, who she accused of having an affair with her best friend. There is, of course, a tragedy unfolding here, especially for the children involved. It's just a shame that it has to unfold quite so publicly. I trust that next week will bring with it news stories of rather more substance. Until then, have a great weekend. Lucy Reed's much-anticipated (well, by me at least) videos aimed at helping litigants in person when appearing in court have now appeared and can be found below. The videos have been produced in connection with the forthcoming publication of the second edition of Lucy's book The Family Court without a Lawyer: A Handbook for Litigants in Person, although they also stand alone. Video 1 gives tips on preparing for court, Video 2 concentrates on what a court looks like and Video 3 gives advice on presenting your case to the judge. The videos provide excellent practical advice for litigants in person going to court and, totalling just over 30 minutes, represent time extremely well spent. 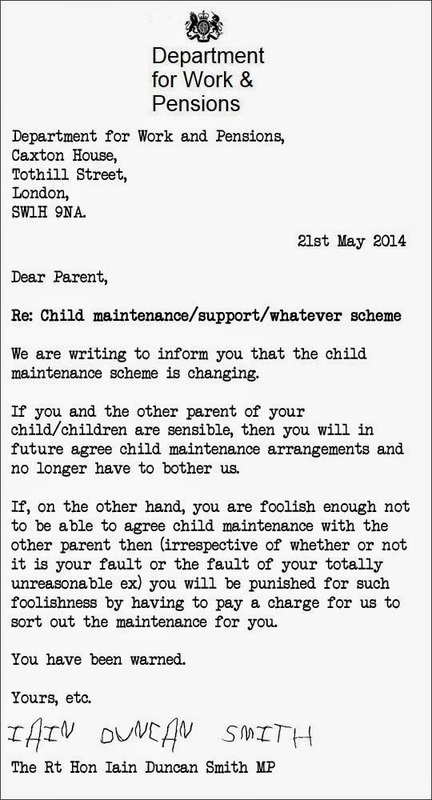 I thoroughly recommend them to anyone facing the prospect of Family Court without a lawyer. 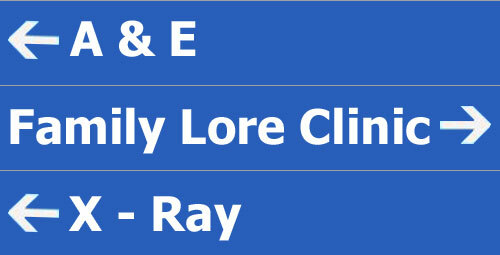 Family Lore Clinic: Filing for divorce and my ex dies - can I still claim half of everything? The first thing to say here is that you cannot proceed with the divorce. Accordingly, you cannot proceed with any claim for a financial settlement within the divorce proceedings. You can, however, make a claim against your ex's estate, assuming that you will not receive reasonable financial provision from it anyway under their will or the law relating to instestacy. When dealing with such claims the court can make the same kind of orders as with divorce claims, and the factors that the court is required to take into account are similar. 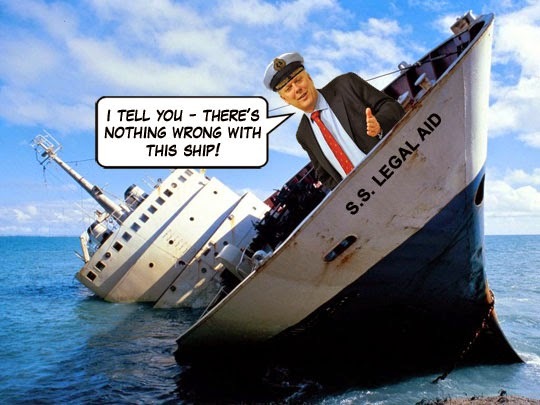 If you find yourself in this position then you really should take specialist legal advice. Please note that there is a time limit upon making claims against an estate and you should therefore act promptly. A brief summary of Re KP  EWCA Civ 554. This was a mother's appeal against an order that her child should return to Malta. The child is now 13 and a half. The mother brought her to this country in June 2013, without the knowledge or consent of the father. The father issued Hague Convention proceedings and the mother relied upon the child's objections and Article 13(b). The matter was heard by Mrs Justice Parker, who interviewed the child and concluded that she was, in reality, very confused and was not, in fact, objecting to a return to Malta as such on any cogent or rational grounds. She also found the Article 13(b) exception had not been established. Accordingly, she ordered the child's return. The principal ground for appeal was that the judge obtained and then relied upon evidence from the child received during her meeting with the child. 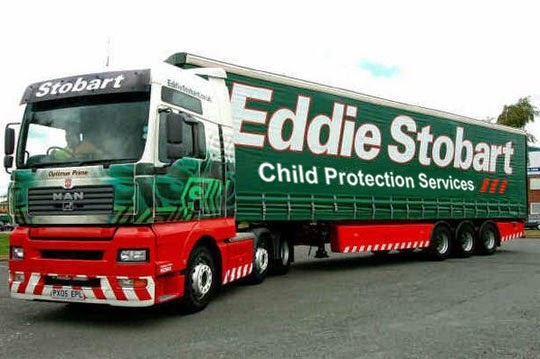 Essentially, it was submitted that the judge was in error in using the evidence thus obtained to support her rejection of the clear and consistent evidence of the CAFCASS officer regarding the child's objections, and in doing so the judge significantly contravened the Guidelines for Judges Meeting Children who are Subject to Family Proceedings. "In stating that 'it cannot be stressed too often that the child's meeting with the judge is not for the purpose of gathering evidence' the Guidelines indicate that there is a firm line to be drawn between a process in which the judge and a young person simply encounter each other and communicate in a manner which is not for the purpose of evidence gathering, and a process in which one of the aims of the meeting is to gather evidence." "Despite having great respect for this judge, who is highly experienced in the conduct of proceedings where the voice of the child needs to be heard, our conclusion is that on this occasion the conduct of the judicial interview did indeed fall on the wrong side of the line." "i) During that part of any meeting between a young person and a judge in which the judge is listening to the child's point of view and hearing what they have to say, the judge's role should be largely that of a passive recipient of whatever communication the young person wishes to transmit. ii) The purpose of the meeting is not to obtain evidence and the judge should not, therefore, probe or seek to test whatever it is that the child wishes to say. The meeting is primarily for the benefit of the child, rather than for the benefit of the forensic process by providing additional evidence to the judge. As the Guidelines state, the task of gathering evidence is for the specialist CAFCASS officers who have ... developed an expertise in this field. iii) A meeting, such as in the present case, taking place prior to the judge deciding upon the central issues should be for the dual purposes of allowing the judge to hear what the young person may wish to volunteer and for the young person to hear the judge explain the nature of the court process. Whilst not wishing to be prescriptive, and whilst acknowledging that the encounter will proceed at the pace of the child, which will vary from case to case, it is difficult to envisage circumstances in which such a meeting would last for more than 20 minutes or so. iv) If the child volunteers evidence that would or might be relevant to the outcome of the proceedings, the judge should report back to the parties and determine whether, and if so how, that evidence should be adduced. v) The process adopted by the judge in the present case, in which she sought to 'probe' [the child's] wishes and feelings, and did so over the course of more than an hour by asking some 87 questions went well beyond the passive role that we have described and, despite the judge's careful self-direction, strayed significantly over the line and into the process of gathering evidence (upon which the judge then relied in coming to her decision). vi) In the same manner, the judge was in error in regarding the meeting as being an opportunity for [the child] to make representations or submissions to the judge. The purpose of any judicial meeting is not for the young person to argue their case; it is simply, but importantly, to provide an opportunity for the young person to state whatever it is that they wish to state directly to the judge who is going to decide an important issue in their lives." Their Lordships found that this "contaminated interview" had influenced Mrs Justice Parker's decision to return the child to Malta. Accordingly, the appeal was allowed and a re-hearing was directed.